Hob is the latest game from Runic Games and represents a big departure from the studio. 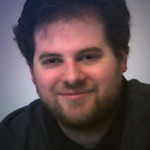 The makers of ARPGs like Torchlight has decided to go in the direction of open world action adventure design. While the game certainly looks beautiful, it doesn’t make the most out of its world. The story of Hob is not told with any vocals. You awaken from what appears to be a shelter by a robot to find your planet is now a bunch of floating pieces. There is a strange corruption that has taken over, and you are the only one who can fight it. Hob has the same stylized look as Torchlight, and the world looks amazing. The main gameplay is built on exploration, with very little in terms of guidance. It’s up to the player to explore and figure out what’s going on, and find the necessary items and collectibles to improve their character. You will be fighting the various beasts that are still around with a sword. Attacking consists of sword swings and using your mech arm to deliver stronger blows. For the most part, combat is more or less a distraction away from the platforming. 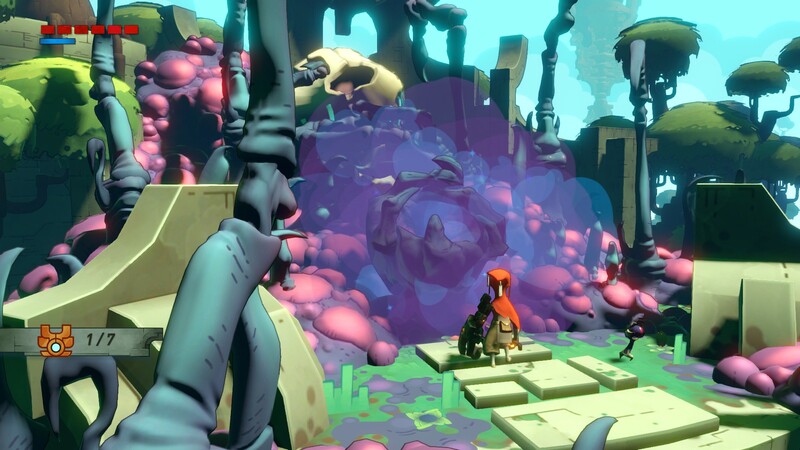 There have been people comparing Hob’s open world structure to Breath of the Wild, but I don’t see that. 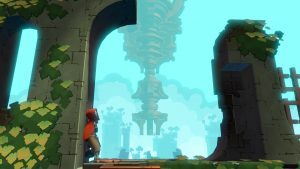 Despite the open world nature of the game, Hob is linear in terms of progress. While Runic Games are experts in ARPG design, they are new to action adventure, and it certainly shows. Hob isn’t a bad game, but it doesn’t do anything unique or amazing with its design. From the platforming side, Hob’s gameplay remains the same from beginning to end. Your goals/progress doesn’t change at all. In each area you will do a bunch of platforming, turn on switches and machines, and open the way to the next one. Even though the different areas have unique obstacles, it doesn’t change what you’re doing. The funny part is that due to the game’s mysterious nature, the ending just came out of nowhere. The as-for-mentioned upgrades are a disappointment, because they are not fully integrated into the gameplay. Instead, they serve as keys to getting around various obstacles. Outside of the requested areas, they serve no purpose or enhance how the player will explore the world. Speaking of exploring, Hob features a fixed camera; for better and worst. There were many times during play that the camera was not giving me the best view of the action, or making it hard to gauge depth when it came to jumping. Another issue is with combat, and how the developers missed the mark. Hob represents Runic Games trying their hand at a reactive combat system instead of the skill-focused design of an ARPG. Unfortunately for them, the combat in Hob is nothing to write home about. You’ll find yourself mashing the X button for the majority of the encounters. While your mech arm is powerful, it’s just too slow (without buying an upgrade) to integrate into fighting. There are only a handful of enemy types in the game, and they all have very basic combat patterns. Just like with platforming, combat doesn’t feel all that different from beginning to end. The game tries to integrate new moves from the platforming upgrades and buying them. While the moves you can buy do offer slight variety, Runic missed the point of the upgrades. Instead of providing you with new options during combat, the upgrades just extend the amount of time you’ll be fighting certain enemies. As the game goes on, some enemy types will be outfitted with armor that must be knocked off. The enemies themselves don’t change at all, and this feels like busy work. I would have liked the new moves to change how you fight over the course of the game. Outside of a few fixed encounters and the only boss in the game, combat is just secondary to everything else that’s going on. At one point, I was just running around all the fights that I could to keep things moving along. Hob is Runic games stepping out of their ARPG comfort zone and is an okay first attempt. It tries to be an engaging action-adventure title, but it doesn’t quite get there on either mark. I would love to see them take things further in a sequel and iterate on what’s there. You can watch my entire playlist of the game on the Game-Wisdom YouTube channel.